Phil on Film: Who Are the Most Influential Directors of All Time? Who Are the Most Influential Directors of All Time? There are many ways to measure a filmmaker's influence. Has a particular director broken cinematic boundaries? Have they influenced whole generations of aspiring filmmakers? Have they established a filmmaking style so distinctive it is instantly recognisable as the work of a singular artist? 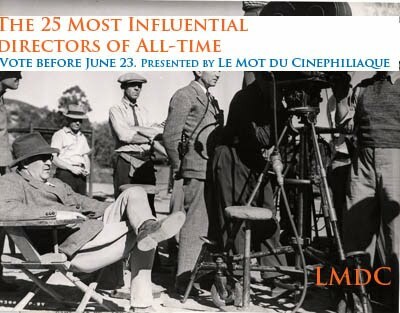 The debate as to who exactly is the most influential director of all time is one that will undoubtedly rage on for as long as we watch films, but Michaël Parent over at Le Mot du Cinephiliaque is bravely taking a stab at answering that question. He has invited fellow bloggers to submit their own choices for the 25 most influential directors in cinema history, and he will be compiling the results after the voting closes on June 23rd. I've already submitted my own list, although it was an agonising task and as soon as I'd finished I thought of some glaring omissions, so I'm hoping to encourage others to follow my lead and help make this poll and wide-ranging and competitive as possible. The resulting list will be fascinating, and will surely spark even more debate.